This is a clip of a BBC Proms performance of the Bach Double Violin Concerto, with Andrew Manze and Rachel Podger. They share the same duties on a CD of the Bach Violin Concertos which I have (permanently) in my car. The CD was a gift to me from Dan & Kirsty Jones some years ago, and probably remains one of the greatest gifts anyone has ever bought me. For this music has become the essential music in my life. I know, that might surprise some. You might think of me choosing some jazz piece for that honour. Or some worship music. Or (with the kind of narcissistic edge that wouldn't at all be out of character) something of any nature, as long as it was by me. I listen to the Bach Violin Concertos pretty much every week. At least once a week. Usually more than that. And it's this recording that does it for me. This recording that has become part of the stuff of life for me. I used to have an old Academy of St Martin in the Fields version (I still have it, somewhere) but the Academy of Ancient Music has replaced it. In all honesty, whilst I know each piece pretty well by now (you'd think), as I listen to them on endless cycle and without a CD cover in sight, I still couldn't tell you "Ah, that's the D Minor" or "Oh yes, the E Major". I just love them. Deeply love them. They are for me, with their endless invention and ceaseless surprise, perfect music. There was a time when I was not well. Some years back. And in that state, I could not cope with stress or pressure or any such thing. In those days, I listened to this music constantly. It centred me. Made life possible. Helped my troubled brain find order and peace. It sounds melodramatic, but really, it helped me live. It's hard now even to remember that time. Yet this music still retains something of the same power - it finds in the sometimes unstructured mess of life a path, an order, a sense which brings beauty to the dullest day. And if my head is whirring too much, or I'm getting frustrated in bad traffic, or I just need to relax or stop a moment or remember what matters and find myself again - then I turn off whatever other music is playing, or abandon the news-life-sport-commentary of Radio Five Live, and go back to Bach. I don't know if anyone else has music which has become "essential" in life. But somehow I have; and the music that found that place for me has never yet once grown tired (and I cannot say how many times I have listened to it in these last few years). That's a token of the quality of the gift right there. It is music that has brightened my mind and brought peace to my soul. Again - some gift. It is music that has accompanied me on countless journeys, so that tired and weary, I have not been alone as I have travelled. It fills the gaps. It is there at the moments that matter. Can music be a friend? It has befriended me. Bach famously ascribed all his music to God's glory. This corner of his output, and this performance of this corner of his output, makes his words for me for an always answered prayer. And as I listen, I am always drawn with profound gratitude to hear the ever-speaking voice of God and to that deeper prayer and to that deeper music of which these notes are but an echo. A glorious, life-giving, essential echo. I read in The Times today of a birthday that shocked me. When I was at college, at Merton Oxford as an undergraduate, I had a tutor who was the archetype of the young academic. He was just a little bit edgy. Just sufficiently sarcastic to leave you unsure where you stood. Intense. Very very bright. I guess I thought he was in his early thirties back then, if I thought about it at all. Already well published & well respected, he had to endure those students who didn't quite get his brilliance. He had to cajole me. He pushed me through the History of Political Thought paper. Not my finest hour. Philosophy & I were never on intimate terms, and often, in those weekly tutorials I would find that nuance was a stranger and the sledgehammer my greatest friend as I wielded my infamous prose style over Rousseau and Locke and Hobbes. My tutorial partner was Germanic in his control of detail. I was George Bush next to him. Though with Boris Johnson's style. After a rip-roaring dash through the Social Contract, my tutor puffed out put his cheeks and said - "Well, that was a tour de force". Nuff said. After finals, we had a historians drinks party. I had been silent about my last essay, my last throw of the dice, my final risk. But news had travelled. This particular tutor sauntered over to me, glass in hand in his particular insouciant manner and uttered one word: "Poetry?" I smiled and demurred. My essay in rhyming couplets was already gaining its notoriety. We were young. It was a long time ago. How long? Yesterday. I was a kid. A stick thin kid with more hair than I knew what to do with. He was hardly any older, drinking in the student bar. Age does not come alone. If he has gotten old what does that mean for me? I read in The Times today of a birthday that shocked me: Professor Robert Gildea, historian, 60. From the torch relay that took forever, through the Diamond Jubilee (and that famous OAP boat ride), to the nearly Wimbledon & the moment Andy Murray became human - even without the weather, the summer of 2012 was always special. And that was before Danny Boyle found our soul & celebrated it so wondrously the night the Olympics began. The whole nation learned to smile as one, to celebrate, to love dancing horses & achievement with endeavour, and valour was valued once more. Well, now it is fading. The September night closes the Paralympics which themselves close this amazing season. It has been the most beautiful dream. And I know that (in those words which Sir Ken intoned back in July) when I wake, I will cry to dream again. Matt would've been twelve today. I meant to get up early. As it turned out, I couldn't quite face the morning. My alarm rang out; I lay still and waited. It took a while. Eventually I braved the day. Washed. Breakfasted. Readied myself for work & headed out the door into the fresh September sunshine. As I walked down the path from the house to the street, I saw a guy who has just started to go to the village church. We greeted each other. He was heading down to church to read a book John the (now retired) vicar had given him. I told him I was heading that way too, so we chatted and parted at the churchyard gates - him to the church, me to the yard. It was a beautiful autumnal morning. I'm sure the temperature will warm up later, but the first chill in the air told the story that the summer has left us, and the year is turning. When Matt died the summer was young, but that was three months ago. They say it gets easier; they're being kind, but of course they know full well it doesn't. Matt still doesn't greet me with that enormous smile of his, those eyes that speak love, that embrace that warms me on the coldest day. I walked down to his grave. And, standing with the fields behind me & the Calverley angel before me, I spoke stories of my days to the earth that covers his remains, and then covered those with tears. There are moments when I feel him close by. The other day I was home, in my front room, and the chair next to me made the noise it made when he would turn on it as he sat there. I stared at it. Empty, of course. There are nights when I would swear his weight rests on my legs. The tricks of grief. The arrows that open up a wounded heart to check it yet may bleed a little more. Back to my car. Back to work. And as I drove, I thought of that passage in the Old Testament, in 2 Samuel 12, where King David loses a son. Before the boy dies, as his life slips away, he begs, pleads, prays the boy might live. When he is lost, David washes himself, dresses, goes to temple and worships. He is questioned about this and his reply is basically - what else should I do? What else indeed. So I switched on my iPod. Chose some music. And worshipped. I'll praise Him for all that is past, and trust Him for all that's to come. O my beautiful Matt. Happy birthday lovely boy. You know that magical moment in the movies when the two protagonists catch sight of each other for the first time across a crowded room, sparks fly, and though their journey will have its ups and downs (and someone-else-will-inevitably-get-in-the-way TMJane Austen) you know everything will end perfectly? I mean, fun, and I love it, of course. But it's rubbish. Well - to be fair, it's rubbish if you are me. Because if you are me, there's a problem: I just seize up. Whenever I'm on the verge of opening up emotionally at a really crucial moment, something in me simply stops working. Some of us are made that way. Confession time: I met someone. Ah there's nice. Of course, yes. Quite right. And it was pretty much a glance across a room & a bolt from the blue thing. I'm not usually that person either, but that's what happened. And we actually got talking, which is pretty amazing. My heart did a thing. No, really. There were smiles. And then I blew it. All my fear stuff (I keep it for special occasions you see) just kicked in. So I turned & started talking to other people. Dancing with other people. Hoping we'd reconnect. It didn't really happen. It was probably never there in the first place. It was just a boring crush; to push myself forward would be to be a crushing bore. One sided. You know. Hopeless. I deflated. Not breathing well, but wanting to speak, I froze. Cold, and on the wrong side of the room, I walked away. I did have a phone number. I left it a couple of days. I risked it. Are you excited? Don't be. There was still a problem. This script still involves me. Though it was nice to discover there's life in the old dog yet, some of us end up single for a reason. It's safer for everyone else that way. And I can laugh at myself even as I torment myself. I've had plenty of practice. And don't doubt I'll get more. After all, there's always hope. Now there's a thought to make a man despair. So - spoiler alert - I've seen the first episode of the new series of Doctor Who, and I'm going to talk about it: questions, answers, jokes, tears, and lots of class. First: the surprise. We got to see the new assistant. Or did we? We got to see the new actress. And she was excellent. Her character clearly has something to do with what is to come... though perhaps some timey-wimey thing will rescue Oswin, & somehow I think we will not see a Dalek travelling around the Universe in the TARDIS. Next: Rory & Amy. I have always enjoyed the Ponds. Rory in particular has grown & grown through his character arc for me. The tender scene as they fought and understood and communicated better than clearly they had done for some time worked its magic well on me. I'm a sucker for a good bit of romance, and in all the humour, action & make-believe of this show, romance matters. The best episodes often carry some kind of fairy-tale element (Matt Smith's first episode; or the Girl in the Fireplace in David Tennant's tenure) and romance is vital in a fairy-tale. Matt Smith has confidence and class oozing out of him as he eases into this third season. He does a wonderful thing where he carries his youth without it being an issue, and at the same time acts old without it being a caricature. The result - I find him wonderfully ageless. Which is what I want to see in the Doctor. I don't want a callow youth. But actually I don't want to think of "Matt Smith" either - and to be fair that's not my reaction as I watch. I just enjoy watching the Doctor. And thanks to a great memory swiping ruse, we have the first question now asked, and safely unanswered, in its original context. 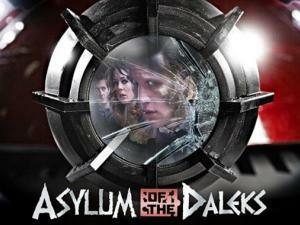 Daleks, destruction, confusion, inbound attack, and a legend (re-)born. Nice touch! Doctor who? Can't wait to find out.